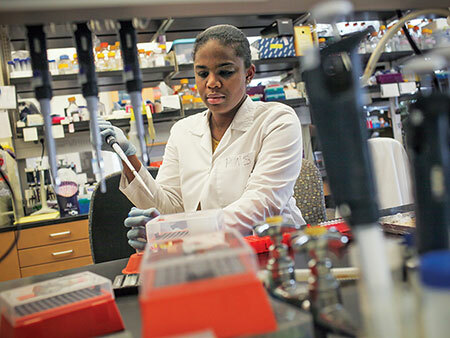 The MU Post-Baccalaureate Research Education Program (PREP) provides opportunities for members of groups underrepresented in the biomedical sciences who hold a bachelor's degree to obtain individualized professional development and academic/ professional preparation before entering a PhD program. MU PREP is funded by a grant from the National Institute of General Medical Sciences. 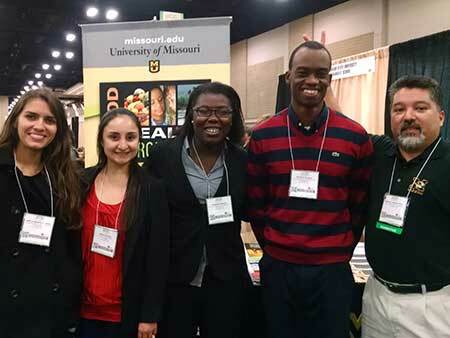 MU PREP scholars and program Co-Director Prof. Michael Garcia at ABRCMS 2014 in San Antonio, TX. 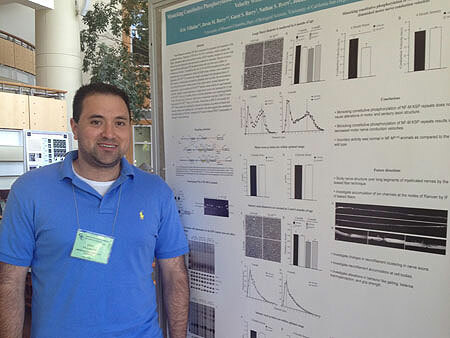 Eric Villalon, former MU PREP scholar, poses beside his poster at the Gordon Conference on Neural Development in August 2012. "The flexibility of the MU PREP program allowed me to first experience diverse areas of research and then to conduct research like a graduate student and understand the dedication necessary to be successful in graduate school." "The lab rotations in MU PREP confirmed that I was interested in being a scientist and increased my confidence in my abilities in science. The graduate level classes increased my confidence that I could make it through the course work for my PhD." "Through the PREP Scholars program I experienced what it was like to do research on a daily basis and see a project from start to finish. 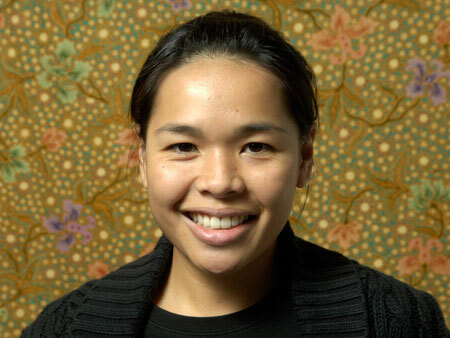 It gave me the confidence to go to graduate school and pursue a career in science research." "The design of MU PREP – to be actively involved in science, participate in national meetings and in on-campus journal clubs, and take graduate classes that corresponded with my unique research interests – prepared me very well for graduate school." "The MU PREP faculty-student working environment contributed to my growth as a scientist. The Journal Club experience in presenting and discussing scientific papers made the transition to graduate school much easier for me." 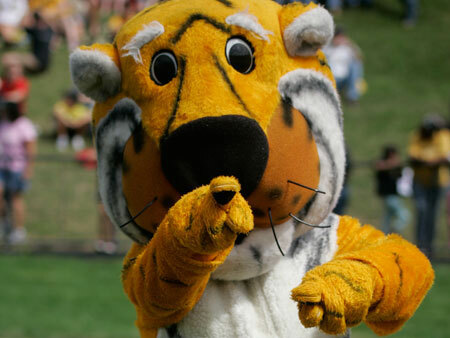 © Copyright 2019 - Curators of the University of Missouri. All rights reserved. DMCA and other copyright information. An equal opportunity/access/affirmative action/pro-disabled and veteran employer.